On the 23rd April 303 AD in Nicomedia, (near today’s Istanbul), St George of dragon fame was beheaded on the orders of the Roman emperor Diocletian. As you’re no doubt aware he went on to become the patron saint of England, and quite a few other places as well as it happens. The story of his life and death is no less fascinating. George was born to a Christian family in about 270 AD in Cappadocia, where his father was an officer in the Roman army. When his father died, his mother moved back to her native Lydda in Palestine (now Lod, near Tel Aviv). There George grew up, joined the army and rose to the rank of comes (count). A member of Diocletian’s personal bodyguard, he was stationed in Nicomedia, then the capital of the empire. In 303 Diocletian issued his first edict against Christianity, which the army was commanded to enforce. When George confessed to being a Christian and refused to obey, Diocletian had him tortured and beheaded in front of Nicomedia’s walls. His body was taken back to Lydda, where his tomb quickly became a shrine where you can still see it there today. Soon wonderful tales about George began to spread. He was said to have been put to death three times, chopped into small bits and buried or burned to ashes, only to be resuscitated by the power of God. 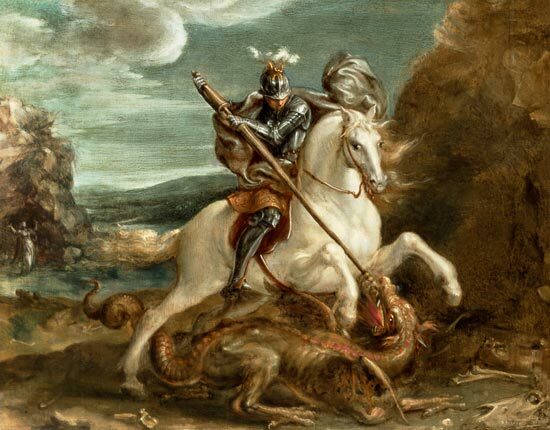 The most famous story is his battle with the dragon, first recorded by the German bishop Arculf in the 7th century, but probably in circulation much earlier. A fearsome drgon lived in a lake near Silena (now in Libya). In order to draw the lake’s water, villagers each day fed it two sheep, but when they ran out of sheep, they substituted beautiftil maidens, selected by lot. One day the king’s daughter drew the fatal lot, but before the dragon could devour her, George rode in. Crossing himself, he charged the dragon and skewered it with one thrust of his lance. Having saved the princess, he then converted the king and his villagers to Christianity and rode away into the sunset. The story may be a Christian allegory of Diocletian’s persecution, with the emperor as dragon, or perhaps a Christianised version of the Greek myth of Perseus, who saved Andromeda from a sea monster, but no matter its origin, many a good Christian believed it. Pope Gelasius proclaimed George a saint in 496, but hedged his bets on the miracles by describing him as among the saints ‘whose names are righdy reverenced among us, but whose actions are known only to God’. Richard the Lionheart adopted the banner of St George (the red cross of a martyr on a white background) for his soldiers during the Third Crusade, and in 1344 Edward III made St George patron saint of England. Four years later he named him patron ofthe Order of the Garter. 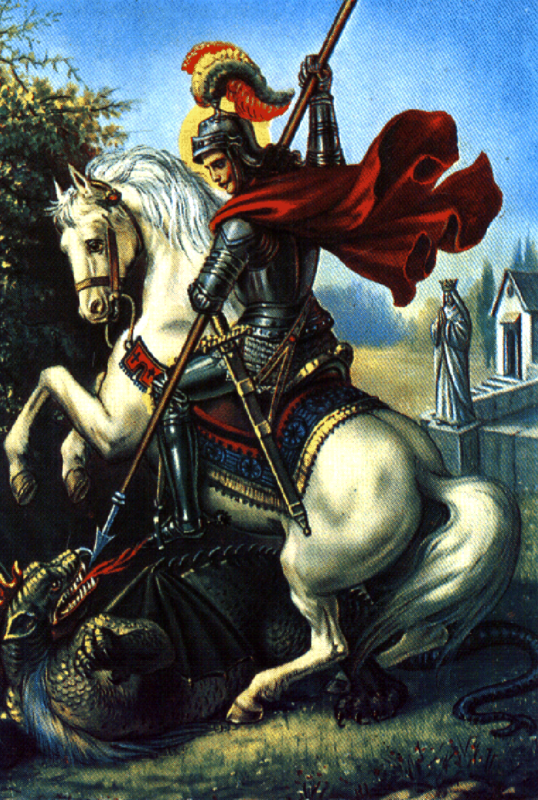 While not busy promoting English causes, St George also managed to become patron saint of Greece, Portugal, Serbia, Canada and Tsarist Russia. He was once a full-fledged saint, but in 1969 the Church downgraded him to the lowest category, commemoration. In 2000, however, Pope John Paul II elevated him once again and awarded him his ‘day of solemnity’.